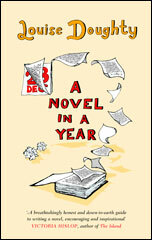 A Novel in a Year was published in hardback by Simon & Schuster UK in June 2007, paperback currently available. The US edition was published by HarperCollins and German edition by Autorenhaus. Mariella Frostrup, Open Book, BBC Radio Four. Listen to the full radio interview with Louise Doughty here. ‘[Doughty’s] voice throughout is warm and encouraging, with an engaging line in self-deprecation. I loved the bit where she advised someone working on a novel about dragons to ‘go to the local woods and find the sort of tree his dragon liked to sit on, or rock, or whatever.’ She can afford that comically dismissive ‘or rock, or whatever’ because she has already dispensed a very wise hint about what she nicely calls ‘lateral ‘research’.